Lock in a great price for Vincci Ciudad de Salamanca – rated 8.6 by recent guests! Free street parking. Quiet neighborhood. Supermarkets around. Good value! Excellent hotel on the edge of Salamanca Historic centre. The breakfast was excellent. Spacious room, great bed, separate shower and fluffy bathrobes. Excellent breakfast. 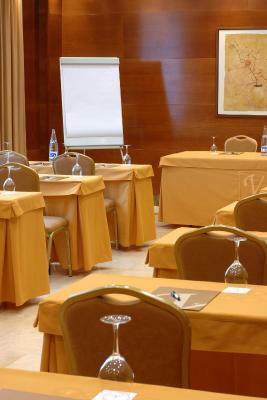 Location was great, just 10 minutes walk to the centre of Salamanca. Comfortable bed in quiet, spacious room. We were jetlagged and slept for 11 hours. Hotel has underground parking, but there was free street parking right next to the hotel. Worth for money, short walking distance from the cathedral and old town. Good mattress and amenities. Plenty of public parking around the hotel. Spotless hotel and large room. Very helpful and pleasant staff. Vincci Ciudad de Salamanca This rating is a reflection of how the property compares to the industry standard when it comes to price, facilities and services available. It's based on a self-evaluation by the property. Use this rating to help choose your stay! 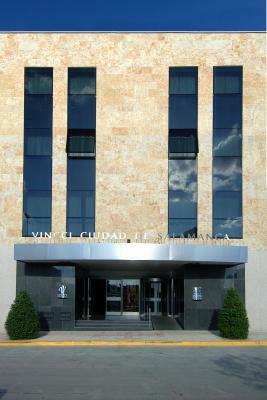 The Vincci Ciudad de Salamanca is within a 25-minute walk of Salamanca Cathedral and Plaza Mayor. Its spacious rooms include free internet access, a minibar and a 32-inch flat-screen TV. The Vincci’s stylish rooms have functional design and hardwood floors. 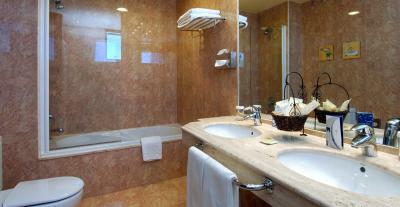 Each has a free safe and a modern bathroom with a hairdryer and amenities. 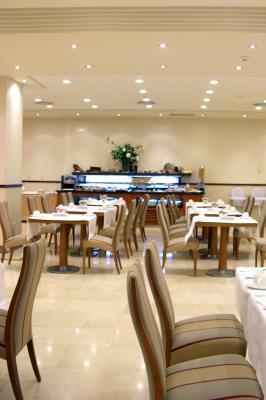 The Ciudad de Salamanca provides a daily buffet breakfast which includes products for celiacs. 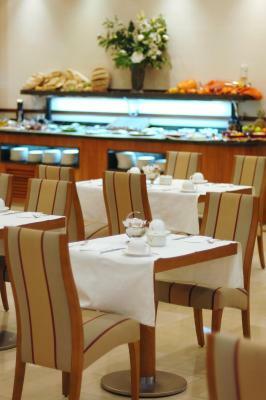 The hotel also has a snack bar serving a wide range of drinks and light meals. 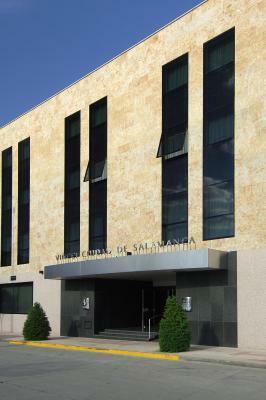 The Vincci is just over half a mile from Salamanca’s Palacio de Congresos Exhibition Centre. The bus stop next to the hotel provides direct services to the center of the city, including Gran Vía and Plaza Mayor. Private parking is available on site and for a reasonable daily rate. 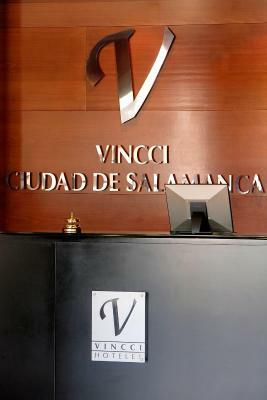 When would you like to stay at Vincci Ciudad de Salamanca? This stylish, functional room includes free internet access, a free safe, a flat-screen TV and a minibar. The modern bathroom comes with a hairdryer and amenities. There is one double bed. Private parking is available on site (reservation is needed) and costs EUR 9.90 per day. This Family Room consists of 2 adjacent Double or Twin Rooms. Each stylish, functional room includes free internet access, a free safe, a flat-screen TV and a minibar. The modern bathroom comes with a hairdryer and amenities. This stylish, functional room includes free internet access, a free safe, a flat-screen TV and a minibar. The modern bathroom comes with a hairdryer and amenities. This air-conditioned room features a flat-screen TV, safe, sitting area and private bathroom with hairdryer and free toiletries. This stylish, functional room includes free internet access, a free safe, a flat-screen TV and a minibar. The modern bathroom has a hairdryer and amenities. There is one double bed. This room includes a free private parking on-site. This stylish, functional room includes free internet access, a free safe, a flat-screen TV and a mini-bar. The modern bathroom comes with a hairdryer and amenities. There is 1 double bed plus an extra folding bed. This Junior Suite comes with a sitting area, flat-screen TV, and a mini-bar. 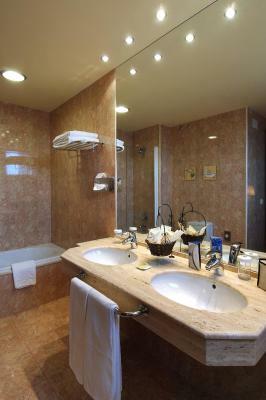 The modern bathroom comes with a hairdryer, free toiletries, slippers and bathrobes. Vincci Ciudad de Salamanca is 15 minutes’ walk from Salamanca's Cathedral and offers modern and functional designed rooms. Its ideal location, near the Palacio de Congresos, makes it the perfect hotel for travellers either on holiday or business. House Rules Vincci Ciudad de Salamanca takes special requests – add in the next step! 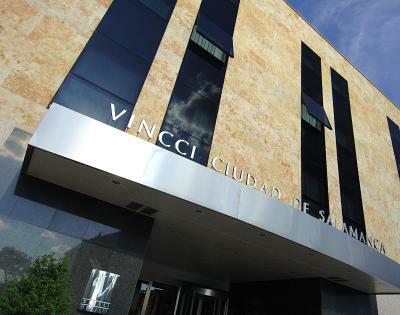 Vincci Ciudad de Salamanca accepts these cards and reserves the right to temporarily hold an amount prior to arrival. The weak pillows and some noise from next rooms, nothing extremely serious. In overall, it was perfect for one night stay. Bed mattress a bit tired and way too soft, needs to be replaced! Free parking. 15m walk in to the center. 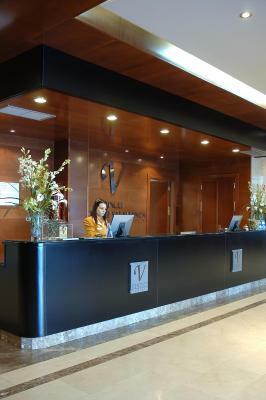 As always efficient helpful staff immaculate room. 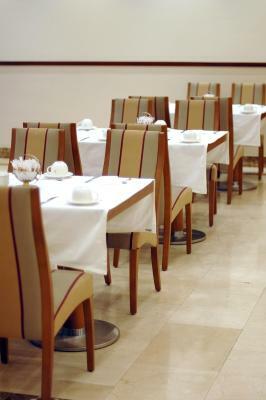 The location, size of room, tea making facilities, very helpful English speaking staff, free parking in the road. We understood the room had air conditioning but it wasn’t working and the staff were unhelpful (it was 26 degrees in our room). We asked to move to a less sunny room, or to be given a fan, and they said no to everything. 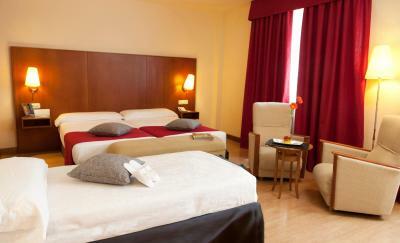 Very spacious room, comfortable bed, good facilities. Location, staff. You could hear everything that happened outside your room, specially corridor wise. Sometimes people knocked on doors close to our room and it seemed it was our own door that was being knocked... Very weird scrambled eggs at the breakfast (maybe powdered ones?) but very nice bread and pastry things. Very friendly staff! The room is simple but clean and the bathroom had a tub and a shower, which was a good option to have. Nothing I didnt like .. all great! Arrived late in evening after long drive. The staff were very friendly and helpful. Secure parking under hotel. Great tapas in bar, then very restful sleep in comfy bed in large room. Liked tea n coffee facilities in room and huge bathroom. Everything we needed and fantastic value for money. Would definately recommend.